Self proclaimed “Shipping Container Architects,” Boxman Studios, have teamed up with marketing agency Advantage International and Hyundai to bring modular, prefabricated architecture to pre-game parking lots across the country. 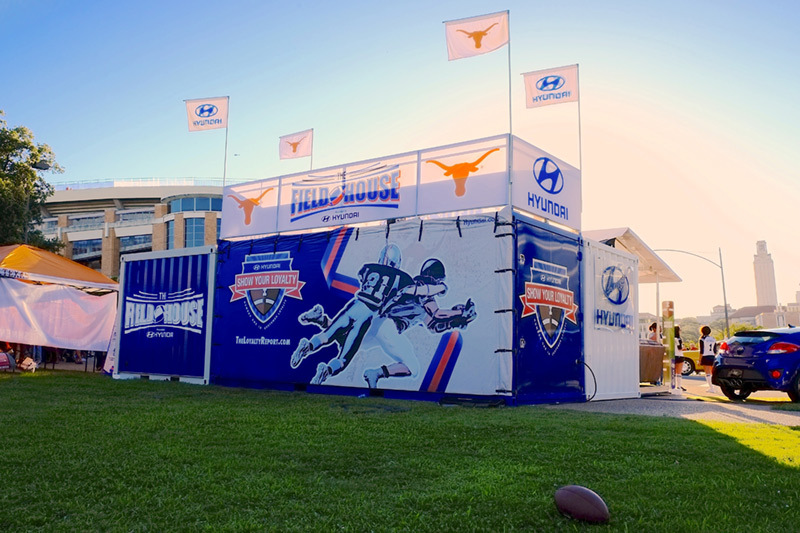 Consisting of three shipping container units, the 1500 square foot Hyundai Field House will be traveling to 25 different college campuses to provide a flexible environment for tailgating festivities. The custom-built containers were crafted from recycled materials and outfitted with bean-bag chairs, barstools, couches, and six HD monitors. The structures’ modular design allow them to be adapted to various campus climates and grounds, from Texas to Ohio, as well as the branding of each team. Each of the three units can function independently, or work come together in a variety of forms to suit their environment.